It’s been about two weeks since I left Japan to make a new home in Australia. Now that I’m unemployed, again, I have plenty of time to reflect on my five years in Yokohama. Here is a quick list of things I’m already missing and things that I’m definitely not missing! It is amazing. Great quality snow, a plethora of beautiful locations to explore, all easy to get to and cheap! It is by far the best place for skiing I’ve experienced. What it lacks in the ‘après ski’ atmosphere that the European resorts have, it makes up for in actual snow. This is also how Japan thrashes the resorts in Australia and New Zealand that I’ve tried. 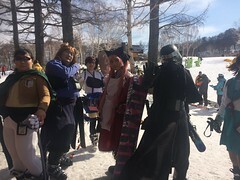 A different type of atmosphere on the mountain in Japan! 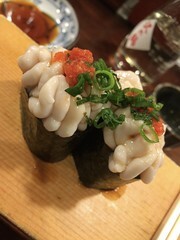 Sushi, ramen, tempura, sushi, okonomiyaki, sushi, yakisoba, gyoza etc etc. Did I mention the sushi? Bathing naked in front of other people was not something I thought I would end up ever enjoying. My first experience of it included a terrible faux pas where I didn’t realise you were supposed to get your own stool. Instead I sat on one that was already in front of a shower which of course turned out to belong to one of the girls in the bath that began giggling at the clueless gaijin. In addition, I never worked out how you were supposed to really clean your nether regions whilst sitting on them. However, there is truly nothing better after a long run or a days skiing, then coming back to a hot, relaxing onsen. It’s incredible! 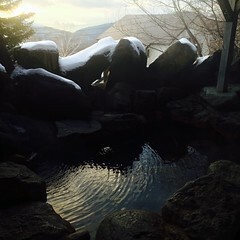 An outdoor onsen in winter – magic! I’m warming to my theme! A toilet that washes, dries, warms your buttocks in winter, cools them in summer, disguises your ‘noises’ with modesty music and does your taxes. Well, may be not the last bit but my washlet toilet did everything else. So lovely! My beloved washlet has gone to a good home! Japan has it sorted. Whether it is the massively efficient and comfortable public transport system or the ridiculously fast internet speeds or the same day delivery or the convenience stores that are everywhere and do everything, there is very little you can’t get done at great convenience to yourself. I lost my house key once and found it a few hours later perched on top of a drink fountain near where I must have dropped it. I left my passport on a plane to Okinawa and had someone present it to me moments before I left the airport. I left my phone in a restaurant and went back later that night to find it had been handed in. Other people have left phones and wallets in trains or restaurants and all got them back. This actually broke me. Japan’s banking system is frustrating, slow and outdated which is surprising since everything else seems to work so well. The last two weeks in Australia, I haven’t shut up once! I’m talking to everyone! People in the queue at the shops, Geoff the Telstra guy, the chick at the chinese takeaway and countless randoms I’ve just bumped in to have all copped it. I was able to get mum’s printer fixed by asking questions at the store! I love google translate but it is so much easier when I don’t need it! Mum still makes me do this because apparently I track a lot of dirt into the house and that is fine. But having to take extra shoes to the gym was a pain. This did my head in! The summer months had either motorbikes or hoon cars doing burnouts right across the water from my flat. Their peak hours of operation were 1am to 4am in the morning. It would be so loud, it was like they were revving their engines on my balcony. Now I have a much more tranquil environment. Check out the birdsong in the evening in mum’s backyard. Sayonara Japan! I loved my time with you. Australia, you have a lot to live up to!